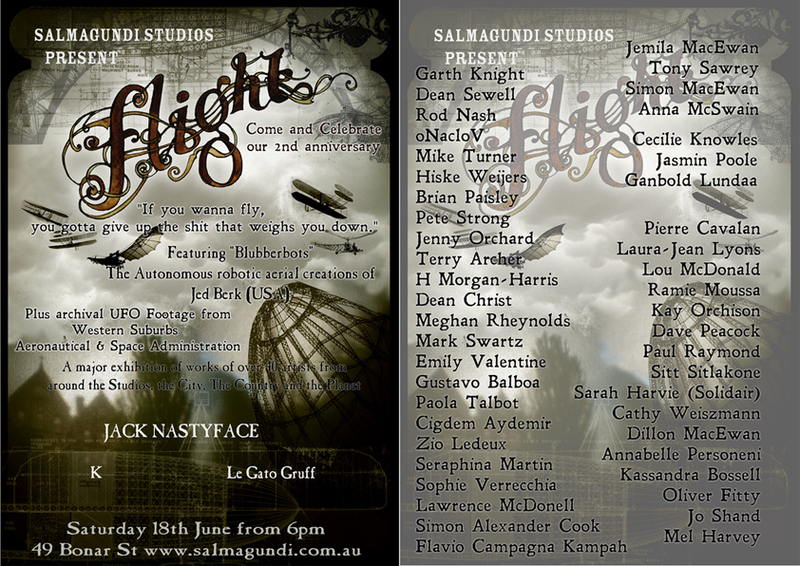 Salmagundi Studios: Flight - This Saturday! From 6pm! 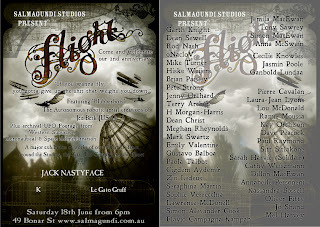 Flight - This Saturday! From 6pm! Do you dream of flying? When presented with the dilemma, "fight or flight", is your first instinct to opt for the better part of valour? Have you, through necessity or expedience, had to flee a situation or locale? Do you indulge in flights of fancy? When about to embark on a flight, do feel excitement, anticipation or dread? An obsession for artists, dreamers, visionaries and inventors throughout time, analogous for ambitions and fantasies, and now such a common practice it's positively mundane. But next time your heading on a flight, just remember you're sitting in a 400 tonne machine, flying through the air, 11 kilometres up in the sky, at around 900 kmh - the correct reaction is FUUCK! and probably afew i don't know about yet! Come along and celebrate out second anniversary!